In a large plastic bucket, add 1 cup Borax, 1 cup vinegar and 4 cups of distilled water. Mix well. Carry the plastic bucket to your shower and pour the mixture onto the shower curtain. 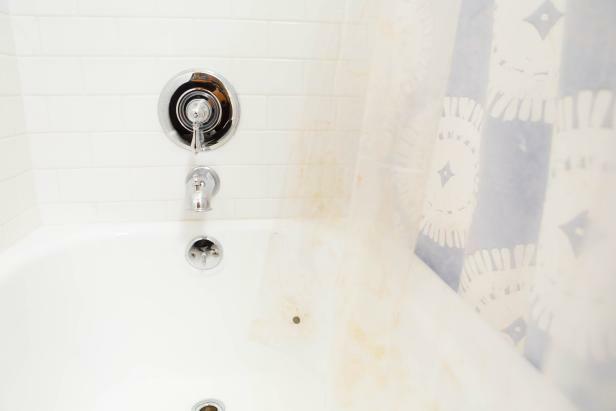 Wear rubber gloves and using a sponge, scrub the dirt and grime off the shower curtain. Finish by rinsing the water off using the shower head. 3. Now Keep It Clean! Place an empty spray bottle on the table and combine 2 cups vinegar, 2 tbsp. liquid dish soap and 1 cup distilled water into the spray bottle using a funnel. Twist on the spray nozzle on the bottle and shake well. Spray this mixture on your shower curtain every two weeks and wipe it clean with a towel. Your shower curtain will look brand new!